I know, everyone claims to have the best banana bread recipe. Mine might not be the best, but it’s pretty darn close. I don’t claim that it’s healthy, I just claim that it’s good. And the secret ingredient keeps it very moist. Every once in a while I’ll add some chopped walnuts or chocolate chips to this recipe, but typically it’s just straight up Banana Bread. Many years ago (like maybe 20 years), while at the grocery store shopping, I spotted a rack of recipe booklets and grabbed one. Hmmmm, recipes full of cottage cheese? I wonder how these will be. Well, I must have decided to try the banana bread recipe, and I must have loved it, because to this day, this is the only banana bread recipe I use. And, how perfect is it that you can use up those tired brown bananas. And banana bread freezes well. Do you start your day with coffee and a newspaper? Maybe you enjoy some quiet time with your devotional. 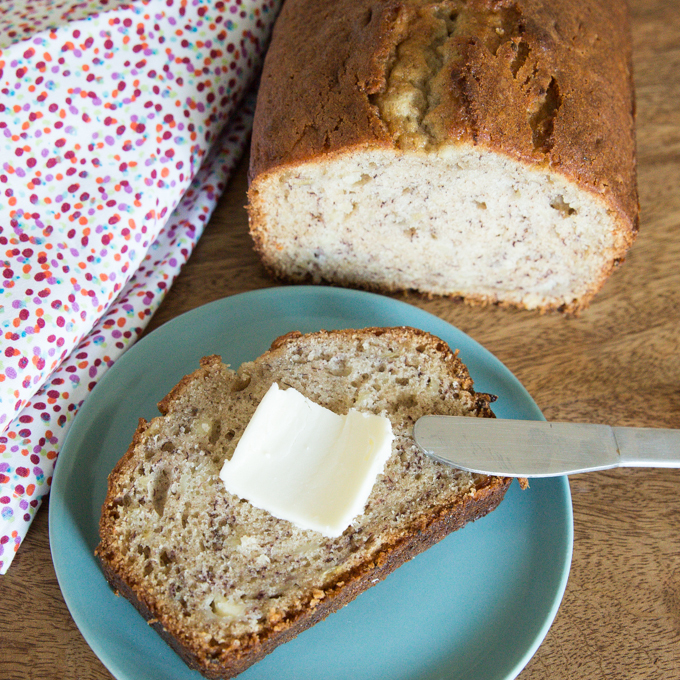 However your day starts, how about adding in a sweet slice of this banana bread? Slice it thick and spread on a little butter, pour a cup of coffee, and sit down and enjoy your day! Beat eggs until thick. Beat in oil and sugar. Stir in cottage cheese and mashed banana. Spoon into two greased loaf pans. Bake at 350• for 45-50 minutes (or until knife inserted comes out clean).